PRIDE of place this week goes to Orla Boyle and Kyla Trainor who helped Down Senior Ladies win the National League Division 3 title with a one point win over Armagh. Well done to both and a special mention to Kyla who lifted Player of the Match Award writes John Murphy. It was a successful night at the Handball Feile last week as both the Boy’s and the Girl’s teams lifted their respective County Feile titles in Clonduff and Saval. The teams were; Rachael McKeown, Aoife Barnes, Colleen McNeilly, Eilis Murphy, Cara McKervey, Cara Doran, Ryan Sterritt, Ronan Murphy, Tim Prenter, Eoin McMullan, Eoin McGrattan, Rhys Cunningham, Ruairi Quinn and Philip Doran. Tim and Rachael were also successful in the skills competition. 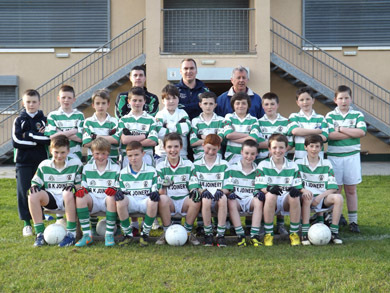 Congratulations to them all and we wish them luck in the National Feile Championships to be held in Limerick in July. Juvenile training schedule at PTR on Saturdays. U-6’s at 10.30am; U-8’s at 10.30am – 11.30am; U-12 Boys at 12.15pm. Juvenile Girls at 10.30pm. Please ensure that you wear football boots, a mouth guard, proper gear for the weather and bring a water bottle. Also make sure that you are checked into the attendance register held by each manager and bring a £1 please. The RGU U-12’s had a good win over Bryansford. U-10s had a good morning at the latest East Down Blitz with matches against Loughinisland, Ardglass and Darragh Cross. The U-10’s travel to Drumaness this Saturday for a tournament. Details at training on Thursday evening at 7pm. U-8’s will attend the An Riocht tournament on Saturday – details at training on Wed at 6pm. We would like to wish all those in the club who are taking exams over the next few weeks the best of luck. Hopefully all the hard work pays off and everyone gets the results they deserve. Hard work in the classroom pays off the same way as hard work on the football pitch. RGU Executive Committee and Members would like to pass on their condolences to the Dawes family on the death of Isabel, mother of former Club Secretary Michael. Ar dheis Dé go raibh a hanam uasal. Tickets are now on sale for the Wolfe Tones. They are coming to the club on 24th August. Tickets cost £20. There will be a range of other events on the August Bank Holiday weekend,and details are to be confirmed. Contact Edel on 07759418419 for tickets.